This speech was delivered by Kevin Roberson, parent of a current student in the Seattle Music Partners program, at the Seattle Music Partners 15th Anniversary Celebration and Fundraiser on March 25th, 2015. Seattle Music Partners is an after school music nonprofit that provides free lessons, instruments, and transportation to elementary school students in Seattle’s Central District. For further information or to make a contribution, please contact them at info@seattlemusicpartners.org. 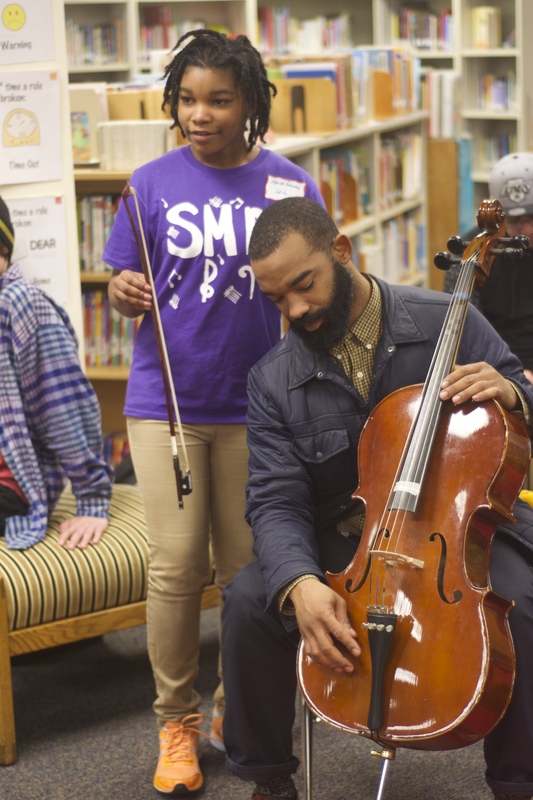 Pictured here is Kevin getting a cello lesson from his daughter Mariah at the Seattle Music Partners Community Night. On behalf of the parents who have put their prized possessions in the hands of the Seattle Music Partners staff for multiple hours during the week and weekends: I want to thank you all. You’ve given our children another essential tool for living in these difficult and troubling times. Utilization of these tools along with critical thought and perseverance is imperative; they will learn to cope and fill voids in their own lives and in turn can share this knowledge in hopes of enriching the lives of their peers. As parents we hope our children develop meaningful relationships and become good at something (sometimes like ‘”God, PLEASE be good at something”). The thing that I appreciate about SMP is that during the course of the year, tutors and staff develop meaningful relationships and yearn for the absolute best for the children. The staff and tutors aren’t just teaching their students about music, they are exemplifying the concept of doing what you love. In my daughter, I am witnessing an eagerness to learn and that eagerness progressing into a love of music. And now I’m hearing, “I love it because she loves it” and “her rehearsal is our rehearsal” in my conversations with other SMP parents. Sometimes it feels like my rehearsal, even though I’m only dropping her off or picking her up. Oftentimes, conversations shamelessly turn to music when crossing paths with fellow parents. It is not unusual to casually toss words like “orchestra” or “cello,” when talking to fellow parents about this program our children are involved in. Nor is it unusual to speak of the visits to the incredible music venues that the children perform in. With music programs being decimated around the country for lack of funding, it’s refreshing to know that this is happening at a public school of all places. But the unrivaled best moments are sitting in a room and listening to her practice. I think of how many doors music can open for her. The more I listen to her, the loftier the goals get and the more I plan. The more I listen to her, the more I am witnessing her growth, and how disciplined she has become. There are even some moments when my emotional suspense peaks—during the compositions with which she struggles to figure out which note comes next and incorporating into the piece. This is a lot like life. Somewhere in her future, finding the right note to fit into whatever she is doing, to play her life song will be essential. This program will have played a role in that. As a parent, I can’t wait to hear that song. Even though she may hit a wrong note here and there, the melody of the song will always be beautiful, and the journey will as well, and I will enjoy every moment of it.